Why Hanson Prefabricated Concrete Sectional Garages? Let’s start with a simpler question – why prefabricated concrete sectional garages in the first place? Given a choice, (and the money! ), most people would specify a brick built garage. The main reason that thousands of people a year specify prefabricated concrete garages is exactly that – they are up to 2/3rds cheaper than traditional brick built buildings. We can all do a lot with the money saved, a new kitchen, holiday or just being able to afford to carry out the project. Again, customers want to replace an old garage that is an eyesore, that is detracting from the value of their property. The other main reason is that a garage adds value to your property. Look here to see how much – you might be surprised, we were! Mean you are dealing with a large national company, not a cowboy builder. Offer a guarantee that means something, it is backed by national suppliers to a national company. Why else would you choose us? Quality – Hanson invest in the latest machinery and methods to ensure that we offer you the highest consistent quality of product and design. 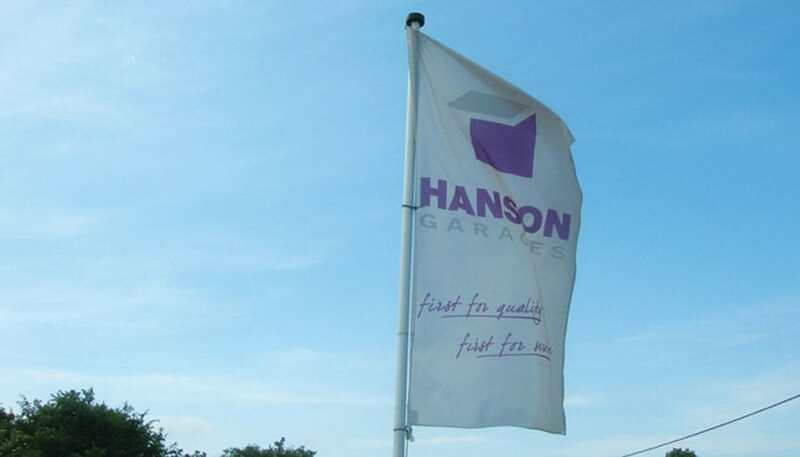 Flexibility – although the Hanson range is comprehensive, it consists of standard products. In addition, Hanson offer a “bespoke” service, with L shaped buildings, Tapered buildings, extra High buildings, extra long buildings, up and over doors in the sides of buildings – tell us what you want, and in all probability, we can do it! Product range – Hanson’s range of TrueBrick front posts look like real brIck – and that’s because they are REAL BRICK! A range of 5 bricks to choose from, AND we can use bricks you supply to match in with your house – a unique service from Hanson. A huge range of Hormann up and over and personnel doors, roller doors, sectional doors, extensive choice of roof covering, both colour, materials and styles, the list is huge. Have a look at the products available, here. When is a Concrete garage not a Concrete garage? When it’s a shed, a workshop, a store, a utility room, a gym, a music room, a play room, a hobby room, an office – the list is endless and limited by your imagination! We can tailor the product to fit your need. Old building removal service – through our network of Building Specialists, we can normally arrange for your old building to be dismantled and removed, saving you the trouble of finding a reliable local builder to carry out the work for you. Base refurbishment/base laying service – again using our network of Building Specialists, we are normally able to arrange for old concrete bases to be refurbished, and, if necessary, a new base to be laid. Completely new base laying is also part of the service. Hanson Building Regulation Application Service – we’ll tell you when your building needs Building Regulation Approval, and provide the necessary calculations to support your application. (This service is chargeable). You will need to ensure that the base is constructed to the right standard, our Building Specialists can help and advise.